The Skynet 5D and Mexsat Bicentenario satellites were lofted on the heavy-lift Ariane 5 launcher’s 53 consecutive successful mission. PARIS — Europe’s Ariane 5 ECA heavy-lift rocket on Dec. 19 successfully launched telecommunications satellites for use by the British and Mexican governments in the rocket’s seventh and final campaign for 2012. It was the 53rd consecutive success for Ariane 5, which has now gone 10 years without a failure. The operators of the two satellites — the British Skynet 5D and the Mexsat Bicentenario — reported that both were sending signals and healthy in geostationary transfer orbit after separating from the Ariane 5 ECA upper stage. 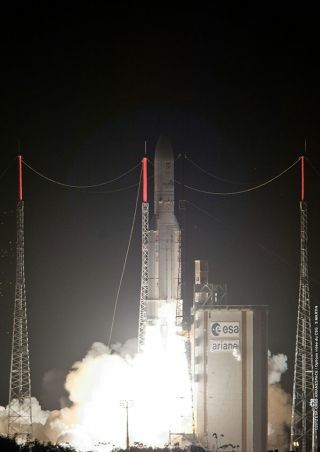 The launch enabled the Evry, France-based Arianespace launch consortium to meet its goal of conducting 10 flights in 2012 — seven Ariane 5s, two Europeanized Soyuz vehicles and the inaugural flight of Europe’s Vega small-satellite launcher — from Europe’s Guiana Space Center spaceport on the northeast coast of South America. Ariane 5 ECA’s inability to generate a steady profit despite its decade of success and the fact that its direct competitors in the global commercial market have struggled in the past couple of years speaks volumes about the market’s business model, European government and industry officials say. The Dec. 19 launch carried satellites ordered by commercial companies acting on behalf of government customers. The Skynet 5D, built by Astrium Satellites under a contract with sister company Astrium Services, will be tested in orbit at 25 degrees east before moving to its operating slot at 53 degrees east in geostationary orbit. The 4,800-kilogram Skynet 5D is the fourth, and likely the last, Skynet 5 satellite ordered under a 20-year partnership between the British Defence Ministry and Astrium Services. The contract runs to 2022, after which the ownership of the Skynet satellites will transfer to the British government, which will then likely organize a fresh competition for satellite services. Astrium Services provides Skynet bandwidth to NATO and individual NATO governments in addition to its guaranteed service to British defense forces. Riding in the lower position on the Ariane 5 ECA rocket was the Mexsat Bicentenario satellite, which will be used by the Mexican government to provide fixed telecommunications and Internet services to Mexican communications that are not attached to the country’s communications grid. The 3,000-kilogram Mexsat, carrying eight Ku- and eight C-band transponders, was built by Orbital Sciences Corp. of Dulles, Va., under contract to Boeing Space and Intelligence Systems of El Segundo, Calif. The Mexican government in 2010 selected Boeing to provide the three-satellite Mexsat system under a $1 billion contract that includes two large Boeing-built mobile communications satellites, set for launch in 2013 and 2014, and the smaller Bicentenario spacecraft. The U.S. Export-Import Bank provided $922 million in loans to support the financing of the three satellites’ construction by the two U.S. manufacturers. Gerardo Ruiz Esparza, Mexico’s secretary of communications and transport, which manages the Mexsat program, said the total Mexsat budget is around $1.6 billion. He said after the launch that the Mexican government is committed to delivering Internet access to all its citizens, and that Mexsat is central to that effort.